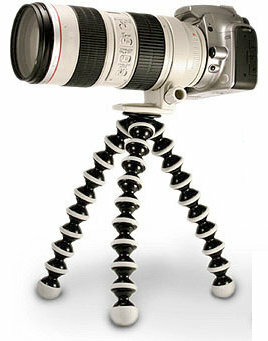 This is the Gorillapod by Joby. I've gone for the biggest, the SLR-Zoom, to be sure it's strong enough to hold my camera and the biggest lens I've got (which isn't very big) and also to be useful when I do finally get a bigger lens (sounds quite pervy). I've got a tripod already, but it's a bit big and cumbersome to trek all the way over to the US and then carry around with us. This little guy measures about a foot long and weighs bugger all. The heaviest part is the head from my normal tripod that I've attached to it for extra versatility. A quick test the other evening proved it's going to be one very useful, flexible and capable tripod. Hopefully I'll get some pretty awesome pictures whilst on our honeymoon too.